For the first time since its launch in 2007, the newest version of Adobe Lightroom focuses on refining the experience for photographers with a few well-built features rather than packing in a bunch of cruft that most of us didn’t want. It may not boast a big list of “new” items, but the features that are here help establish LR 5 as the best yet. 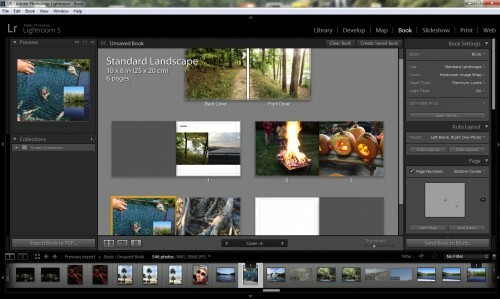 Adobe seems to have taken that message to heart with the latest retail release of its photo management software, Lightroom 5. We’ve taken it for a spin over the past month, and walked away suitably impressed… but what we were most impressed with was Adobe’s commitment to ironing out kinks to a winning formula, rather than redefining and redesigning a tool designed for workflow management. 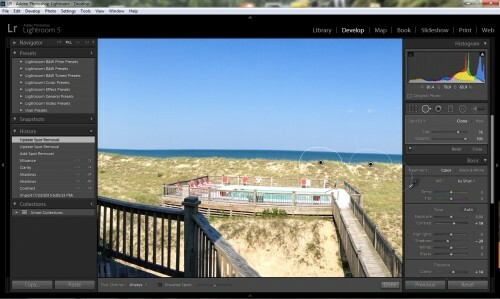 Lightroom 5 has a rather short list of improvements and additions, and nearly all of them help it to stand on its own as an image editor designed purely for enhancement of photography and videography instead of adding more bloat. In fact, I’d dare say that most consumers will upgrade based mostly on one reason – the Advanced Healing brush. However, this short list of new features is deceptive – many of these bring Lightroom into the forefront for the first time as a true image processing center, rather than a front-end for Photoshop. New splash screen, same old layout. That’s a good thing. I’ve been using Lightroom since v1.0, and I’ll be honest – this is the first time I can say I felt that it was the nexus to my projects, instead of just my light-table to decide what would make it to final editing. So, this will be a short review – if you are unfamiliar to the background behind LR, I recommend you check out my in-depth examination of Lightroom 3 from a photographer’s view, and my review of the features Lightroom 4 added. The top feature addition in LR5 has got to be the Advanced Spot Healing brush, which is really misnamed. It should be called the “Get this crap out of my shot!” brush, because that’s exactly what it does. Previous incarnations of the Spot Heal brush would allow you to fix one circular brush stroke at a time, which could amount to some tedium if it did work and some garish results if it didn’t. Spot healing a blemish on skin was always a quick and easy fix, but getting rid of an errant signpost or passer-by in your beautiful landscape didn’t go very well. These types of tasks would always end up being handed off to Photoshop, which would then allow you the Content-Aware healing and fill modes for larger areas. Now, the Advanced Spot Heal brush allows you to “paint” an area of your image that you would like to fix, however large or irregular in shape. It will attempt, based on the results, to find an appropriate area to replace it with (which you can move, should you disagree) and then blend the replacement into the shot where you painted. For all intents and purposes, this is Adobe CS5’s prized Content-Aware tool, and I would argue that it is far more at home in Lightroom than in Photoshop. It’s not perfect – you will likely need to refine the edges with smaller fills, and it obviously will work better on repetitive backgrounds like grass, pavement or brick – but very little time is needed to get a very printable and believable result. It’s nice to know you stand a chance to fix the unaware pedestrian that wanders into your perfectly framed shot! The second major “fix it” is the Upright tool, which is designed to fix skewing of buildings and other clearly defined lines. Though this seems to be billed in Adobe’s literature as a good way to correct a crooked picture, that’s actually very little of its point – the Upright feature is actually Photoshop’s “Perspective correction.” Anyone who has shot a building from the ground floor is well-versed in the “keystone” (or pinched) look that the building will have, where all of the vertical lines converge as they move farther from the camera. Formerly, Lightroom had no way to correct this distortion cleanly, but the Upright tool fills that gap and removes another huge reason for going into Photoshop. You can choose to straighten horizontal lines, vertical lines, or both; Lightroom will stretch, compress and reshape the image to suit as much as possible. In my fiddling, I found that the “Auto” button, which sits above these other choices, will attempt a much more mild correction than if you choose one of the specific options. I would have really enjoyed a bit more control over this process, but I’m also not sure that would be within the scope of what Lightroom is trying to accomplish. Going much beyond these basic settings would truly wander into complex image manipulation, and the “quick clicks” seem to function quite well on their own. You may not get the fine-grained control over it that could create new artistic effects, but you really are just a couple clicks from having perspective and tilt issues fixed. 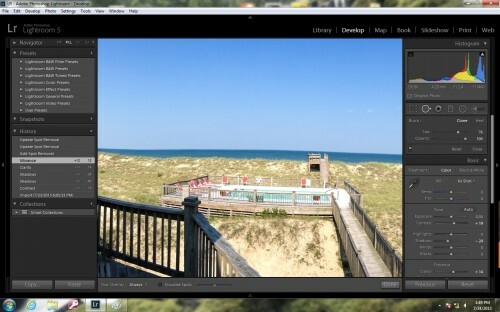 It’s a beautiful addition that I never thought would complement the software’s other lens correction tools so well. The other absolutely major inclusion in Lightroom is going to initially sound ridiculous – radial gradients. Yes, that’s right, a simple circular gradient… It amazes me that it took five versions of this software before we had one (I guess Adobe figured the brush shape and masking worked? It didn’t… ). However, I can stop complaining now – not only do we have radial gradient features, but they can even be deformed into oval gradients! 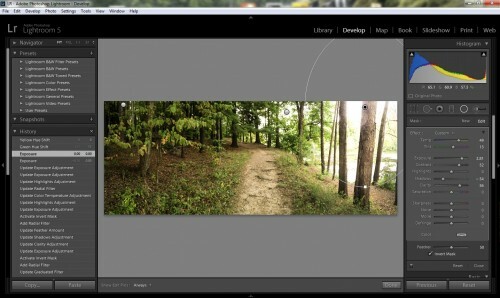 Lightroom 5 finally allows radial selections, which dramatically change its editing ability. Oh sure, I can hear you mock me from here that I think this is a huge feature – but anyone who has ever experienced the beautiful plugins from Nik Software and its U-Point system, or OnOne’s “Focus Bug”, knows just how useful radial and oval gradients can be. They are particularly well-suited for contrast and color adjustments, bringing focus and attention to your subject while subtly shifting the viewer’s eye off of distracting background imagery. I would say that a good 90% of my post-process work in Photoshop involves copious use of radial gradients for selection or adjustment layers… and it feels a lot more like home to have them now showing up in Lightroom. This change, even on its own, would be worth the price of admission to me. Though I know most people will think, “ok, so we have circles… what’s the big deal,” I am willing to bet that they will become an unsung hero of the the transformation of Lightroom from “Photoshop Frontend and organizer” to “Photography Suite.” There is simply no reason for these to have been lacking in prior versions, and the newfound inclusion will make a tremendous difference in the speed of getting things done. They are simply more accurate and more powerful than brushes can be in many situations, but particularly where you want your effects and alterations to be subtle, smooth and blended. For anyone who has ever wanted to turn their slideshow into a video file, Adobe has answered your prayers. Slideshows now have the ability to contain both picture and video, as well as a musical overlay, and be exported to a video file to post on your favorite social network. Huzzah. The book export has also been revamped a little bit… or maybe a lotta bit. I didn’t get a lot of use out of this in LR4, but mostly because I found that the templates were a little rigid (for lack of a better word). I had hoped to see it get some improvement in the form of new templates, but it looks like Adobe one-upped my request and gave a whole slew of abilities to edit and create new templates. Finally, books can contain page numbers, captions for both images and whole pages (on the same page, no less!) and can have colors and fonts adjusted from within the program. If you particularly like the result, you can save your modifications to a new template for next time. These adjustments turn the Book export module into one of the most versatile methods possible for getting your photos “to the masses” – far more customizable to me than the Web module (which has languished and is in desperate need of remaking). I’m really glad to see this, and though I’d love to see some competition offered to Blurb by partnering with other bookmakers, I’m happy with the results I’ve seen so far. For any regular user of Lightroom that hasn’t tried this module yet, LR5 leaves you no excuses – it’s easy, and I think it produces a very high-quality result. Finally, we have Smart Previews, which are actually somewhat of a replacement for the full-size JPG previews in your catalog. Smart Preview is a lossy DNG that is limited in size, but the benefit isn’t really the image itself, but what you can do with it. Lightroom 5 finally allows you to edit shots that have a Smart Preview version offline, which means that you no longer have to take your entire catalog with you or plug in that USB drive if you don’t have it handy. Any changes you make will be implemented on the original 1:1 the next time the drive is synced. This on its own is a pretty slick feature, but gets better when you start looking at file sizes – the Smart Preview gallery takes up roughly 10-15% of the space that a gallery with full-size JPEG previews would, which is what used to be required for editing. Road warrior photographers who do editing on a laptop or ultrabook will be loving this, and rightly so. Lightroom 5 is a very odd program to write a review for. It doesn’t have a laundry list of new inclusions, and that somehow makes it a better release than if Adobe had tried to cram a bunch of new features in. What they lack in number, they make up for in function – none of these changes are unwelcome, none of them detract from Lightroom’s core ideas, and every one of them is a feature that either should have been here already or is showing up right on time. Further, each one that Adobe has added is executed so ridiculously well as to not be able to impart the true user experience in this review – you’d have to have used prior versions to know just how deeply these features will truly add to using the program. For the first time ever, Adobe Lightroom can be considered a truly stand-alone product that no longer hides under Mother Photoshop’s skirt. Nearly every addition to the product this time is tailored at image editing instead of catering to ridiculous social media fads (the map feature?) or half-baked execution (the old Book module). We’re finally at the point where I can start to levy my last two real complaints regarding Lightroom at Adobe – the methods for plug-in ties, and the Web export module. With Photoshop now moved to the cloud and Lightroom being such a functional product on its own for today’s pro-sumer, it’s time to start taking the plugins as seriously as if they belonged in PS. Panorama-stitching with PTGui, HDR rendering with Photomatix, and cleaner transport of files to and from Nik and OnOne (along with others, but those are the two I’m most experienced with) along with better control for creating, editing and publishing effect presets all need to be evaluated. Moving even one file to the external editing still seems to require ridiculous import/export steps and extra copies, but trying to move eight or nine to PTGui or Photomatix is downright brutal. But seriously, before we even get to the plugins, the Web export module has gone through such disrepair while Adobe tweaked and built other functions that I would nearly declare it unfit for use… I hope Adobe will start there. In five releases, we’re still looking at mostly the same very ugly, very poorly customizable templates as we’ve had since v1.0. HTML5? Mobile device layouts? Forget about it…we still show pictures on the web like it’s 2002. It amazes me that for all of its efforts in partnering with Blurb for books and whoever for the stupid mapping program, Adobe hasn’t yet even thought of looking to a template house like Wix for web design, which could offer photographers something worth using. However, even with an entire paragraph complaining about the plug-in synergy (which made Adobe famous for every piece of software but Lightroom) and another pointing out a ridiculously unmaintained feature, I have nothing but love for Lightroom 5. If you’re already a Lightroom user, consider the $79.95 upgrade price well worth it for the new feature-set, and enjoy not having to go into an external editor nearly as much. If you aren’t already a user, well… now is a good time to start, especially at $150. It will cost less than your next point and shoot, and it will drastically improve your photography life.